GMA Network, in partnership with Gerry Pens Promotions, Inc., is all set to air the much-awaited bout between Manny ‘PacMan’ Pacquiao and Adrien ‘The Problem’ Broner as the Philippines’ Pambansang Kamao seeks to defend his WBA Welterweight title against the former four-division world champion tomorrow, Jan. 20. Pinoy fans can catch Pacquiao versus Broner via satellite on GMA-7 beginning 10:00- a.m. while an exclusive blow-by-blow coverage of the fight will also air on GMA’s flagship AM radio station Super Radyo DZBB 594 and in all Super Radyo stations nationwide from 9:00 a.m. to1:00 p.m. 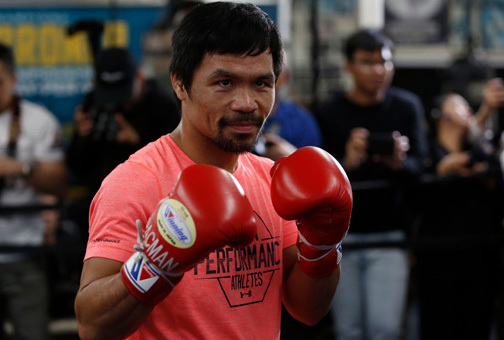 The first big boxing showdown of the year, which is slated to happen at the MGM Grand Garden Arena in Las Vegas, marks the first time that Pacquiao returns to fight in the United States after two years. Eight-division world champion Pacquiao, who holds a 60-7 record including 39 knockouts and 2 draws, is determined to defend his title after his knockout victory over Argentinian Lucas Matthysse in his last fight in July last year. A replay of Pacquiao versus Broner will be aired on the same day at 10:30 p.m. on GMA Sunday Night Box Office (SNBO).